Make sure to ask the right question so that the question returns the data you actually want. not the thoughts/feelings/intentions of others. Make sure the question doesn’t lead or pressure the respondent towards a certain response. Provide an adequate rating scale. Yes/No or Dislike/Neutral/Like may not provide enough options for the respondent to reply honestly. I always look for the words “and” and “or” when I’m writing or reviewing questions. If I see an “and” or an “or”, I immediately check to see if I need to split the question out into multiple questions. “Problems with Survey Questions” by Patti J. Phillips. This covers much of what we looked at in this and the previous post, with several good examples. “Performance-Focused Smile Sheets” by Will Thalheimer. This is an excellent commentary on writing level 2 and level 3 surveys. “Correcting Four Types of Error in Survey Design” by Patti P. Phillips. In this blog article, Patti give a quick run-down of coverage error, sampling error, response rate error, and measurement error. “Getting the Truth into Worplace Surveys” by Palmer Morrel-Samuels in the February 2002 Harvard Business Review. You have to register to read the entire article, or you can purchase it for $6.95 (registration is free). If you are interested in authoring best practices, be sure to register for the 2014 Questionmark Users Conference in San Antonio, Texas March 4 – 7. See you there! Last week I wrote about deploying compliance-related assessments, as part of a series of posts offering good practice recommendations from our white paper, The Role of Assessments in Mitigating Risk for Financial Services Organizations. 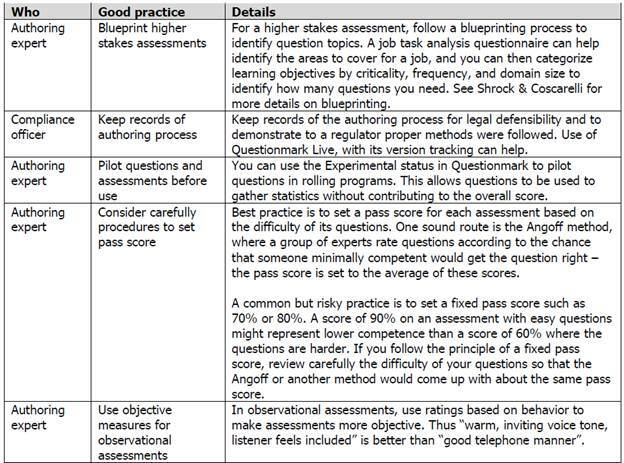 This paper describes five stages of deploying legally defensible assessments, along with specific recommendations for people in different job roles. Some of these recommendations are specific to Questionmark technologies, but most can be applied to any testing and assessment system. Sharon Shrock & William Coscarelli’s Criterion-Referenced Test Development: Technical and Legal Guidelines for Corporate Training provides actionable, practical advice on test development. Sharon and Bill will conduct a workshop on writing valid, reliable tests in Baltimore on Sunday, March 3. Participants will explore testing best practices and will learn how to meet rigorous competency testing standards. You can register for this workshop when you register for the Questionmark Users Conference or add the workshop later. It’s up to you!